Rosh Hashanah, literally “The Head of the Year,” is the culmination of a month-long period of study and self-examination. It a day of judgement, a day of joy, and time of renewal. As a day of judgement , Rosh Hashanah, also called Yom-ha-Din, is a solemn time. As a day of joy, Rosh Hashanah commemorates the birth of the world, the wondrous act of creation. And its time of renewal, Rosh Hashanah offers Jews an opportunity to reaffirm their faith in God and to contemplate His faith in His people. Rosh HaShana, the Jewish New Year, focuses on God’s judgment and ultimately on a new beginning for humanity: hayom harat olam—the day the world is born anew. The major themes of Rosh HaShana are the creation of the world, the sovereignty of God, divine judgment and remembrance. These themes present an opportunity to identify the creativity that persists every day—the sovereignty of God as the power or energy in the universe that makes for a renewal of humanity, of the world and of community. It becomes the responsibility of humanity to make manifest “God’s Kingdom” on earth through acting upon our moral principles and values in order to bring about justice, peace and beauty for all people. There is, however, one important similarity between the Jewish New Year and the American one: Many Americans use the New Year as a time to plan a better life, making “resolutions.” Likewise, the Jewish New Year is a time to begin introspection, looking back at the mistakes of the past year and planning the changes to make in the new year. Rosh HaShanah literally means “Head of the Year” in Hebrew. It falls in the month of Tishrei, which is the seventh month on the Hebrew calendar. The reason for this is because the Hebrew calendar begins with the month of Nissan (when it’s believed the Jews were freed from slavery in Egypt) but the month of Tishrei is believed to be the month in which God created the world. 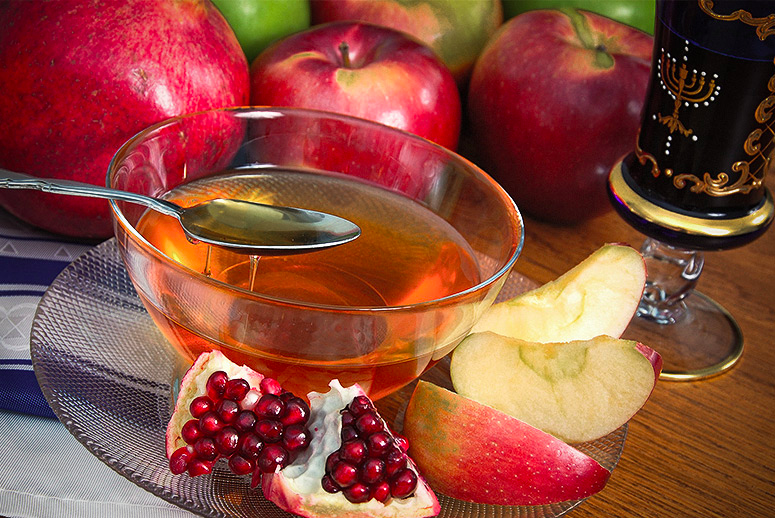 Literally translated as the Head of the Year, Rosh Hashanah is known by many names. Yom Ha Zikaron – the Day of Remembrance; Yom T’ruah – the Day the Trumpets Sound; Yom ha Din – the Day of Judgment. It is also known as Hayom Harat Olam – the Day of the World’s Conception. While throughout the machzor [Holiday prayer book] we will refer to God as Ha Melech [the King] and Aveinu Malkeinu [Our father, our king], calling on the strong, powerful, masculine aspects of God. These are also the days on which we will repeatedly call out God’s attributes, beginning with “Adonai, Adonai, El Rachum v’hanun,” relating to God as the source of rachamim—compassion—the eternal rechem or womb from which the world came—and continually comes—forth. When the holiest days in the Jewish calendar begin Sunday at sundown, Jews worldwide will be praying for repentance and a good new year. For Reform Jews using a new High Holy Days prayer book, belief in God won’t be required. The Central Conference of American Rabbis has revamped the religious text used for a generation by the Reform movement — the most liberal arm of Judaism — for Rosh Hashanah, the Jewish New Year, and Yom Kippur, the Day of Atonement. Texts have been updated to be more feminist and gay-friendly, to acknowledge congregants with physical limitations and even to leave room for disbelief.